This beach getaway home serves as a frequently used retreat for the owners and their extended family. The existing waterfront 50’s rambler was far from meeting their functional and aesthetic sensibility. The house is situated in a cluster of similar homes that have evolved from summer camp structures. 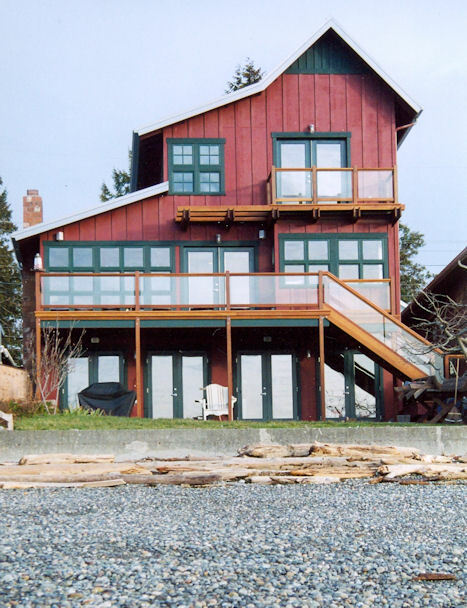 The existing house took only minimal advantage of the view over a beautiful beach and distant Strait of Juan de Fuca in the Puget Sound. To meet the client’s goals, the remodeled 2 level house was functionally zoned, with the mid-level designated as the living and gathering area. A master suite was added at a new partial 3rd level. The lower level is guest quarters and play area. The mid-level acts as a buffer between the private spaces of both the owner and guests. Every effort was made to expand the views and extend the interior to the outdoors at each level. Bedrooms were removed from the mid-level, allowing more open and naturally lighted spaces to be created at the gathering level.